Steve Okonski captured his first Rail Baron championship with a come-from-behind victory in a close and exciting 6-player Final match. At the end of the 6.5 hour long Final, 3 players had a solid chance to win on their next turn. The very balanced match saw no players bankrupted, and no railroads auctioned or sold back. Also advancing to the Final by means of victory in their 5-player semifinal matches were Chuck Foster, Mark McCandless, Ed Rothenheber and James Wicht. Former Rail Baron champion Kevin Quirk advanced by finishing as the top second place player in the semifinals, but was unable to attend, and was replaced by first alternate Malcolm Robinson. 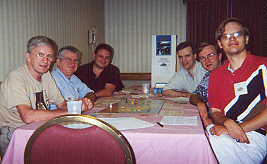 The turn order for the Final was Mark, James, Malcolm, Chuck, Ed and Steve. The railroad purchase order was fairly typical. James was first to arrive (round 2) and chose the WP. Ed also arrived in round 2, but opted to not make a purchase. Chuck grabbed the NYC upon arriving in round 3. All other players arrived during round 4, with Mark snapping up the valuable PA, James the B&O, and Malcolm the C&O. Shut out of the important NorthEast and with Chuck bound for Charleston, Ed took the SAL, and Steve the ACL. Perhaps distracted by having the first unfriendly destination, Chuck did not make a purchase upon arriving in Charleston. Later he expressed regret about not buying the NYNH at that point. With help from the $5000 from Chuck's use of the ACL, Steve was barely able to afford the AT&SF during round 8. The race for NorthWestern railroads began early, with Ed picking the CMStP&P in round 9, James taking the GN in round 14 to connect to his WP, and Malcolm the NP in round 19. At round 13, Mark upgraded to an Express engine; he was the only player to do so. Later that same round, James opted for speed and decided to make his second purchase the Superchief ($28,000, as per RBN Optional rules). The next big western railroad to be purchased was the UP; Ed selected it in round 14. Players who were close to affording the SP instead punted by selecting cheaper railroads: Mark took the D&RGW and James the C&NW in round 16. But Chuck, who had been saving up, was first to manage SP's $42,000 price tag in round 19. From the rapidly shrinking supply of railroads, Steve connected his ACL and AT&SF by means of the GM&O in round 17. This left only the SLSF as the way for Ed to connect his SAL and UP, but the other players worried more about their own networks than disrupting others': Mark selected the CRI&P, James the CB&Q, and Malcolm the NP. Because of a trip to unfriendly San Diego, Ed was unable to afford the SLSF before Steve arrived again. But Steve chose the SOU with an eye to getting nearer the NorthEast rather than picking up the SLSF and sabotaging Ed's network. Because the SOU serves Washington, Steve would be able to connect to Mark's PA and James's B&O without having to also use Ed's RF&P. The SOU was a fortuitous choice because Boston was his next destination, and rail use fees were about to increase. Due to a series of sluggish dice rolls, Chuck arrived one turn too late to purchase the IC, the last available that would connect his network. Mark had already bought it in round 27. Later that round when Ed purchased the N&W, all the railroads had been sold and the match was about 2.5 hours old. The networks were as follows: Mark: PA, NYNH, L&N, D&RGW, CRI&P, IC. James: WP, B&O, GN, C&NW, CB&Q, T&P. 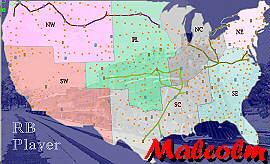 Malcolm: C&O, NP, MP. Chuck: NYC, B&M, SP. Ed: SAL, RF&P, CMStP&P, UP, SLSF, N&W. Steve: ACL, AT&SF, GM&O, SOU. The weighted percentage of destinations served and monopolized were as follows: Mark 56.2%, 1.99%; James 49.8%, 1.39%; Malcolm 34.9%, 0.0%; Chuck 44.5%, 2.3%; Ed 50.0%, 5.0%; Steve 41.1%, 1.6%. Malcolm and Chuck struggled with non-connected networks, but both managed to stay in the game as well as avoid auctioning or selling back any railroads. With their connected, but limited networks, both Ed and Steve had trouble generating and keeping cash. Steve didn't manage to upgrade to a Superchief until round 40, and Ed not until round 47. 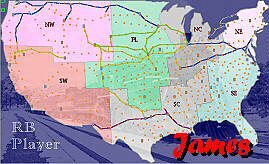 James built his own western RR by connecting WP, GN, and C&NW; combined with his B&O in the NorthEast, his main problem was the SouthEast. Mark, who had started with the always useful PA (not to mention the NYNH), could not get further west than the D&RGW without incurring unfriendly rail use fees. When Mark stunned the group in round 49 by announcing he had reached $150,000, both Ed and Steve lagged way behind with around $50,000 in cash. As if the announcement were a jinx, Mark promptly began a series of difficult trips to Seattle, Little Rock, Las Vegas, Pueblo and back to Las Vegas. In the 15 rounds from 48 to 63, Mark paid Ed the $10,000 use fee an incredible 9 times. James was next to announce (round 57), followed later that round by Ed. A cash check in round 60 showed Mark with $173,000, James with $172,000 and Ed with $174,500. Not surprisingly, all players began to minimize use of the leaders' railroads. Consequently, Malcolm, Chuck and Steve began to collect rail use fees at an increased rate. In round 61, Ed arrived in Tampa, just 7 from his Birmingham home, but had $199,000; his next destination was unfriendly Buffalo. By the time he arrived in round 64, Ed had received more use fee payments, and had enough cash to run home, 13 dots away. However, he decided to not declare, wound up with Kansas City as his next destination, and promptly tossed 13 for his roll, enough to win had he declared. Still, Kansas City was only 10 dots from his home, so it seemed Ed's decision was vindicated. About the same time, Mark was bound for New Orleans (18 from his Buffalo home) with around $200,000, and James to Denver (13 from his St. Louis home) also around $200,000. Meanwhile, Steve was making some long trips: Cincinnati, Phoenix, Columbus, Los Angeles, and Richmond, and collecting a few use payments. He arrived in Richmond just after Ed began his trip to Kansas City, and his surprise $150,000 announcement only increased the tension of the match further. Steve drew Chicago as his next destination, meaning he would not be far from many players' home cities, including his own (Atlanta). Ed managed to consume his full roll upon arriving in Kansas City, and in round 67, just 10 from home, he declared. This time he rolled 5. All players were in the vicinity, and probably any one of them could have rovered him. The roll was too small to run away, so to the surprise of most players, Ed headed directly for home, as well as for his convenient alternate destination of Charlotte. His plan was a interesting one. He figured he had just enough cash to be rovered, arrive in Charlotte (only 6 from home) and make another declaration attempt. Steve went next, and mustered a roll of 6, which was just one more than he needed to rover Ed and collect $50,000. After paying use fees, Steve had $213,000 remaining, and was stuck on an unfriendly railroad. In the next round, players scrambled for positions all around the center of the map. Ed hoped for a roll of 12, which would put him into Charlotte ready to declare, and almost certainly win, the next round. The uncooperative dice only gave him 8. Next, Steve wandered to consume his roll of 11 into Chicago, where he collected $8500 and sat just 11 from home. Ed's chances were diminishing: he needed someone to pay him $10,000, and he needed to roll a 6 bonus bounce out of Charlotte. Neither happened, and in round 69 Steve declared, rolled 14, arrived home and ended with $200,500 to capture the win. Chuck, Rail Baron GM for many years, commented that only once before had he seen a win in the Final without a major NorthEast railroad, and never with a network as limited as Steve's. The cash flow from railroad use fees was (in thousands): Mark +$85 ($140 out, $225 in); James -$10 ($140 out, $130 in); Malcolm $-155 ($260 out, $105 in); Chuck -$10 ($130 out, $120 in); Ed +$115 ($70 out, $185 in); Steve -$25 ($135 out, $110 in). Not surprisingly, the PA was tops, producing an income of $120,000 for Mark. In the final scoring, Mark took second due to a large cash stash ($260k), Ed third, James fourth, Chuck fifth, and Malcolm sixth. Each finalist took home a plaque attesting to his RBN expertise. Overall in the Rail Baron tournament, 69 entrants (up 20% from 1999) played in 29 matches for a total of over 500 player-hours. That's one of the highes player-hour totals at the WBC. The longest match was the semifinal Chuck won that ran for 7.5 hours. The shortest was a first-round match that finished in about 2.5 hours. Twenty-three players won first-round matches, and 22 of whom showed for the semifinals where 3 alternates advanced to create five 5-player tables. The railroads found most frequently in the winner's network were (26 macthes total for which there is this information): UP (15 times), L&N (13), PA (12), SOU, NYNH, and B&M (11 each). The railroads least often in the winner's network were: IC (1 time), B&O, C&O, CB&Q, SLSF, C&NW, and N&W (3 each). Luke Koleszar earned the Casey Jones Award by virtue of his 11 unfriendly destinations (Carmen Petruzelli also had 11, but was edged out in the tie-breaker). The Persistence Award went to Charles Davis (played 3 first-round games without a win). The Efficient Engineer Award went to Larry Kratz ($117,000 was the lowest-cost winning network). The Riches to Rags Award was won by Mary Kratz ($63,500 net worth was lowest without going bankrupt). Michael Zorrer took the Long Haul award (winning with just 17 destinations). Mike Stanley won the JP Morgan award (highest net worth: $515,000). And Brian Smith was named Sportsman for helping out in some difficult matches. Thanks to all who participated, and hope to see you in 2001! Rail Baron is The Avalon Hill Game Company's / Hasbro's Trademark for its Empire Building Game. Any BPA GM who wishes to create a Web page for his/her game is welcome to copy the HTML of this page and modify it as needed.